Ms. Alice Jefferson-Buckley was born on October 29, 1926 in Sparkman, Arkansas. She was the only daughter of the late Henry and Elnora (Smith) Jefferson. Mrs. Buckley spent her early childhood in Gum Springs, Arkansas. She attended the Gum Springs Community School and Peak High School in Arkadelphia. After high school, she moved to Arkadelphia and was employed at Deaton and Arkadelphia Cleaners. Alice met and fell in love with Matthew Buckley Sr. and they were married on December 31, 1949. Within this union were ten children. She was a homemaker who was a faithful wife and a loving mother. She was always cheerful and although very outspoken she loved everybody. Mrs. Buckley's christian journey began at Tate Temple Church of God in Christ under the leadership of Superintendent O.N. Dennis. Later she moved her membership to Davis Memorial Church of God in Christ where she was an Elderly Mother of The Mother's Board Department. She expressed her love to the Davis Memorial church family and she served faithfully before her health failed. 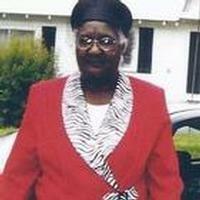 Mrs. Alice Jefferson-Buckley was called home to glory on April 9, 2014. She was preceded in death by her parents, Henry and Elnora (Smith) Jefferson, her husband, Matthew Buckley Sr., and two daughters. She leaves to cherish her precious memory: four daughters, Alice hunter, Maxie Buckley, Dorothy (Dennis) Beasley all of Arkadelphia and Patricia Boles of Malvern, AR; four sons, Matthew Buckley Jr., Louis Buckley, Jimmy Buckley all of Arkadelphia and George Buckley of Tampa, FL; nineteen grandchildren, thirteen great grandchildren, one sister-in-law, Mrs. Alberta Jefferson of Lansing, Michigan and a host of neices, nephews and friends. Funeral services will be Thursday, April 17, 2014 at 1 p.m. at the Greater Plesant Hill Baptist Church with Elder Benny Johnson officiating. Burial will be in the Shady Grove Cemetery under the direction of Mitchell Funeral Home. Visitation will be Wednesday from 12 to 5 p.m. at the funeral home with family hour from 6 to 7 p.m. at Davis Memorial Church of God in Christ.